For as long as I can remember I have enjoyed visiting the British Museum and walking through the galleries. Even on a short visit to London I will often make a short detour to take in a new gallery or to revisit old 'friends'. And if I have wanted to take an image I could do so quite freely. There is an institutional commitment to universal access. British scholarship has had a long association with the publication of the sculptures from the Athenian acropolis. Humfry Payne and Gerard Mackworth-Young [both directors of the British School at Athens] collaborated on the beautifully photographed Archaic Marble Sculpture from the Acropolis (1936). The banning of photography on such a well documented collection could send out an unfortunate signal. It will send out a message of encouragement for those who speak about cultural retentionism. If the Parthenon marbles were returned from London to Athens, would access to them be severely restricted? Would members of the public or interested academics find it easier to study the sculptures in London or in Athens? Is it time for those responsible for this new policy to revise it? I agree with this-- why not photograph things that are ultra-well published (the Moschophoros) ? It adds to the sacralizing atmosphere-- which only gives argument to the Cuno-style reasoning that this is all about "nationalism"
A key issue to address is why ban photography? After having worked in a private cultural institution one understands that photography rights can be utilized for copyright and other revenue generating ventures. However, can a national museum prevent its own citizens, from whom it derives most of their income via taxes, from photographing the institution's collection? Clearly, it raises numerous issues regarding ownership and it leads to museums monopolizing culture. This is surely a wrong decision which must be reversed soon by our Greek friends. 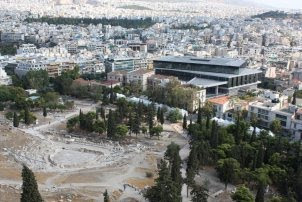 It not only gives ammunition to the retentionists in Bloomsbury but also works against the desire of the Greeks to have more visitors and tourists to the New Acropolis Museum which is the pride of Athens. The retentionists in London can always argue that in the British Museum you can take as many photos as you like but in Athens this is not allowed. This works as a great support for those arguing that the British Museum enables more people to learn about the sculptures. It comes so soon after the Greeks have demolished the argument that there is no suitable museum in Athens for the Marbles. Whoever took that this decision has not carefully considered its implications for the whole debate on returning the Marbles to Greece. One significant aspect of modern tourism is the pleasure of tourists to take photos of the places they visit. This helps them to remember the interesting places and objects they have seen and also to tell their friends and relatives about their experience. But if they cannot photograph the sculptures in the New Acropolis Museum, the joy of visiting the museum will be considerably reduced. Fancy going to Athens and taking pictures of all the sights you see except the Parthenon Marbles even though this may have been your primary motivation for visiting Athens. How can we convey our full impressions to others at home if we are unable to take photos of the world-famous sculptures? How can we convince others that the Parthenon Marbles in London would be best seen in their reunification with the remaining Marbles in Athens if we are unable to show visually the missing parts in Athens? I thought the whole idea of the exposition of the Parthenon Marbles in the New Acropolis Museum was to show the missing parts which are at the moment kept in the British Museum. How can we forcefully convey this message in the absence of photos from the Marbles in Athens? The decision banning photos in the new museum is, in a way, partial negation of the digital revolution which has enabled people to communicate their impressions by means of modern photography. This unfortunate decision must surely be reviewed and reversed soon. Obviously some cultural material is damaged by flash photography and unfortunately people don't know how to turn the flash off, hence reasonable photographic restrictions. In this case, it appears to be a simple enforcement of property rights. For as long as cultural material is treated as just another form of property, there's really nothing that can be said of these kinds of policies.